Wiley (owner of Blackwell) has published a list of the most popular articles in their journals in 2009. It’s hard to know what the definition means, since the criteria are not explicit (e.g. it includes articles published before 2009), and no rankings or numerical scores given. However, scanning through the list is one article on open innovation — the Enkel, Gassmann and Chesbrough introductory article to September special issue on open innovation. The article — “Open R&D and open innovation: exploring the phenomenon” — is available for free download. I have a few quibbles with the article (since my friends didn’t send it to me for comment beforehand :-) but overall it summarizes the advances in research on open innovation since the publication of the 2006 Chesbrough et al book Open Innovation: Researching a New Paradigm. So if someone wants a place to start on open innovation research, that would be a good place to start, as well as my earlier post on the most influential O/U/CI research. As I’d mentioned earlier, I’ve been working on trying to integrate open, user and cumulative innovation (which I refer to as O/U/CI or OUCI). Some of the ideas of my first (2007) cut comparing these three streams have been published in the Washington University Journal of Law and Policy. 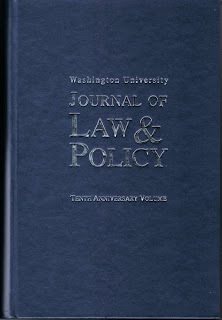 (This specialty journal ranks #174 on a list of some 1100 law journals). The paper was in a special issue called “Open Source and Proprietary Models of Innovation: Beyond Ideology.” Abstracts for the special issue can be found at the WUSTL law school website. (It was actually published a few months back, but I’ve been swamped). The edited volume (Vol. 19) compiled work presented at an April 2008 workshop of the same name hosted by Charles McManis. I was privileged to be invited to offer one of the keynote talks, and to be surrounded by a lot of bright open source researchers (mostly lawyers) for two days worth of stimulating discussions. (Video of some of the sessions is available online). I believe my own paper is the first published paper to contrast these three streams of research on neutral terms. However, the discussion of these three streams is relatively brief. Since I was speaking to lawyers, the back half of the paper is about implications, and thus its title: “Policy Challenges of Open, Cumulative, and User Innovation.” It considers how these different streams would make different predictions (or normative recommendations) for policy in areas such as taxation, antirust, or infrastructure development — presumably of greater interest to lawyers than to b-school profs. The working paper is on my website, and I have a PDF of the actual pages if anyone is interested. Meanwhile, I continue to extend the more detailed O/U/CI comparison presented in Hamburg last June. More news as it becomes available.